A girlfriend of one of our editors just summed up 2016 nicely in a text: THIS. YEAR. We know what she meant. So — considering you’ll be breaking bread with people you love but don’t necessarily agree with between now and next year — we don’t blame you for needing a drink. Or seven. 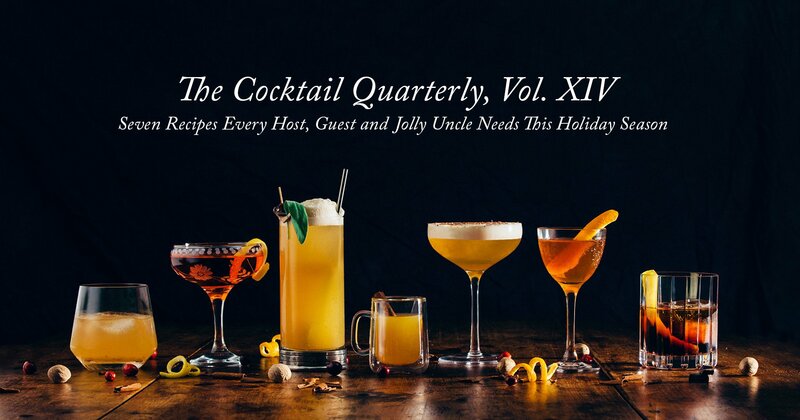 And thus we present the Cocktail Quarterly, Vol. XIV, stocked with seven classy cocktails engineered for holiday imbibing. Recipes below. And remember: if you can’t identify the drunk uncle, you’re probably him. Stir all of the ingredients in a mixing glass with ice. Strain into a coupe. Garnish with the orange twist. Build all ingredients over ice, stir vigorously. Strain into a single rocks glass over a single large ice cube (or sphere). Squeeze a piece of lemon peel over the top of the cocktail to express the oils. Shake with ice and strain into rocks glass. Top with a dust of nutmeg. Dry shake. Shake. Strain into a tall glass bottomed with 2 oz. club soda. Garnish with two cherries and a sage leaf. Add all ingredients, except for coconut cream, to stirring glass. Add ice and stir. Strain and pour into a coupe or rocks glass. Layer cream on top and garnish with dark chocolate shavings. Add ingredients in a wine glass. Stir in Prosecco. Add a splash of cranberry juice. Garnish with a lemon twist. Combine all ingredients in a large punch bowl. Serves 6-8. Also: For every bottle of the specially-designed Belvedere bottles purchased, 50% of the proceeds go towards the fight against AIDS via the (RED) organization. You can purchase a bottle here.